CLICK HERE TO VISIT WWW.DAVIDHPHOTOGRAPHY.COM! Second Shooting with Carla Swinney! I had a wonderful opportunity to second shoot a wedding with my friend and fellow photographer Carla Swinney last weekend! As an added bonus the bride is actually cousins with my wife Anna...so it was a win-win. I was assigned to the groom for all the pre-wedding photos and I had balcony duty during the ceremony. 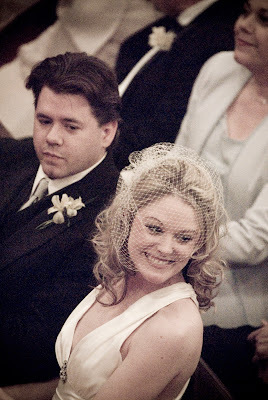 Here are a few of my favorites from Kate and Carl's wedding. 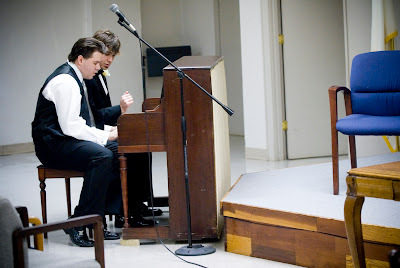 Carl and his brother passed time at the piano during the wait before the ceremony. I snagged this one while Carla was shooting a group photo. So I can't really take too much credit for this one! 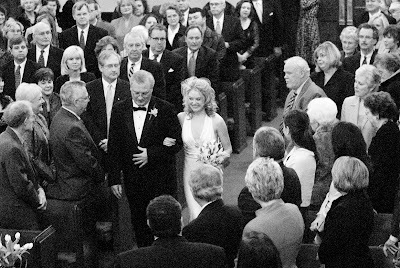 Kate and her father as they walked down the aisle! This was probably my favorite photo from that evening....they had probably been "man and wife" for maybe 2 minutes at this point. I shot this right after the photo above...it looks like a retro postcard! Congratulations to Kate and Carl and many thanks again to Carla Swinney for allowing me to assist her! 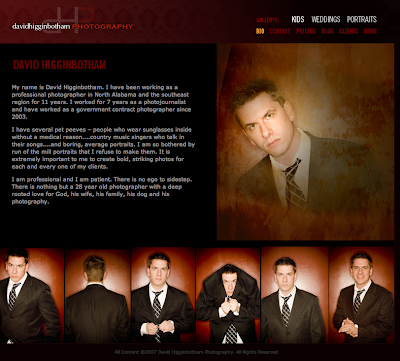 Click here to check out the new David Higginbotham Photography website! My buddy Jim Callahan designed it for me. This link takes you to his art site but you can contact him there! My lovely wife took some temporary bio photos for me last night...but stay tuned though for new ones coming soon! After several years of doing a so-so job of designing my own website I have finally put it in the hands of a professional! It's something I should have done a long time ago! • A brand new bio page! I don't have a specific date for when my new site will launch...but keep checking...it won't be long now! Devin and Heather are getting married! MY OLD BLOG, "DAVE'S BLOG"
A Little News - Gary Cosby Jr.